My daughters followed Us Weekly and the Kardashians to stay up-to-date with all the latest fashion trends. Meanwhile, IWCO Direct has been an expert source for direct marketing trends for nearly 50 years. In a way, we are the Kardashians of direct marketing (a comparison that would earn several eye rolls from my daughters, by the way). It’s important to IWCO Direct and to our customers that we stay on top of direct marketing trends. In some cases, it can help us save our clients money, like when we are on top of the latest USPS mailing promotions. In others, it helps us ensure that our company is well-stocked in the materials, technology and services that will be in the greatest demand. But more often than not, it allows us to assist our clients in reaching their customers with the right message, at the right time, in the right channel for increased ROMI and stronger brand loyalty. In 2015, we predicted personalization, increased mobile device adoption and multi-channel analysis as some of the biggest trends for 2016. These predictions turned out to be right in line with what we saw from the industry this past year. For 2017, we foresee some of the same trends continuing, while we think others will take a more commanding place in the spotlight. Many marketers understand the benefits of omnichannel marketing and unified campaigns across different media. This drives a more unified, collaborative effort between marketing partners and creative agencies. The growth of demand in omnichannel marketing is one of the reasons our strategy and creative services departments continue to expand and encompass more direct marketing channels. Targeted messaging has been a big direct marketing trend over the last few years, and it continues to grow without showing signs of stopping. Not only does data-driven targeted marketing better resonate with a prospective customer and increase the probability of a response, it is now an expected part of every campaign. Consumers are becoming data-sophisticated and are interested in targeted, relevant marketing. This is perhaps thanks to the fact that a growing number of millennials, who are now in entering their prime spending years, are knowledgeable about how data gathering works and expect it to be used to their benefit. Despite worries from marketers that direct mail is becoming outdated and undesirable, research is showing the opposite to be true. Not only are direct mail volumes on a steady rise, but surveys are reflecting a desire for mail, citing the credibility and – dare I say? – novelty of physical mail as the reason for high response rates. In fact, mail is expected to take a larger seat at the table due to the first two trends listed, as direct mail is a great tool for connecting marketing efforts, driving response through other channels and targeting specific audiences. 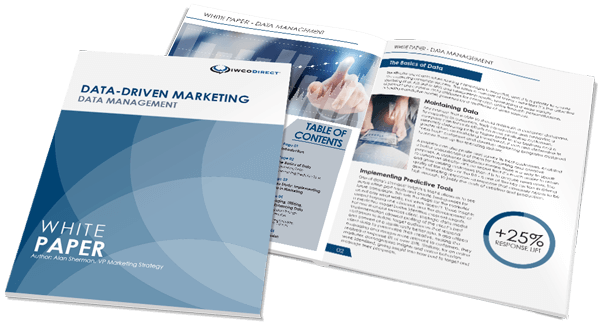 Winterberry Group describes direct mail as the “alpha channel” in our data-driven marketing world. Marketers across multiple verticals continue to view direct mail as relevant, tactile, effective and scalable. Winterberry’s 2016 study, From Theory to Practice: Bringing Omnichannel to Life, shows U.S. marketers believe targeted acquisition is direct mail’s sweet spot. In addition, 40% of U.S. marketers surveyed recognized direct mail as an “omnichannel team player” well-positioned to drive value in concert with other media channels. Keep following SpeakingDIRECT to stay on top of the most recent direct marketing trends. If you’re wondering how your next direct marketing campaign can take advantage of these up and coming trends, contact the Kardashians of direct marketing today. We promise, no eye rolling.